The violinist Miranda Cuckson started to play Mario Davidovsky’s “Synchronisms No. 9” (1988) just after 3 p.m. on Sunday at Spectrum on the Lower East Side. While the piece is a duet with electronics, it begins with a plaintive solo line, lonely yet warm, like the glow of firelight spied across a snowy plain by night. 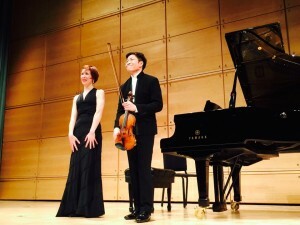 It sounded, to my surprise, not so far from Sibelius, whose darkly lustrous “Nocturne” (1906) another violinist, Paul Huang, had performed at the Walter Reade Theater at Lincoln Center just a few hours before. I had chosen to take in these two recitals in the same day as a study in contrasts, a symbol of the variety in the city’s cultural scene. Old music, newer music; uptown, downtown. But the continuities and similarities turned out to be more striking than the differences. What I’d thought would be a stark separation of classic and modern turned out to be a sustained reflection on Romanticism and its reverberations. Not that these two violinists don’t have distinctive styles and sounds. Mr. Huang is a rising artist: A recent prize winner in the Young Concert Artists International Auditions, he will be a member of the Chamber Music Society of Lincoln Center’s CMS Two program for young musicians from this fall until 2018. Appearing under the auspices of Lincoln Center’s sweet Sunday Morning Coffee Concerts series, he played with a coppery, wiry bite, and ample vinegar laced his honeyed tone. This gave his sound focus and cut away at the sentimentality, even in the most poignant lyrical passages. In this rendition, Janacek’s Violin Sonata (1914-15) — Jessica Xylina Osborne was the alert pianist — never seemed quaint, bristling with taut tension before relaxing, a bit, into uneasy calm. Even Sarasate’s picturesque “Romanza Andaluza,” from “Spanish Dances” (1879), was more wry than over the top. Mr. Huang does well by emotive pieces, like Grieg’s poetic Sonata No. 3 in C minor (1886), mainly by doing them with a measure of restraint.